I had planned a lengthy commentary for today, but then my personal life stepped to the fore and cut short not only my trading session, but also just about everything else. So, I have a number of charts to share, but with less words than I originally intended (some readers actually prefer the pictures anyway). Also, there are a fair number of words on the charts themselves, which provides an ongoing cover for those who tell their spouses that they read my work "for the articles," and not just to drool over the pretty pictures. 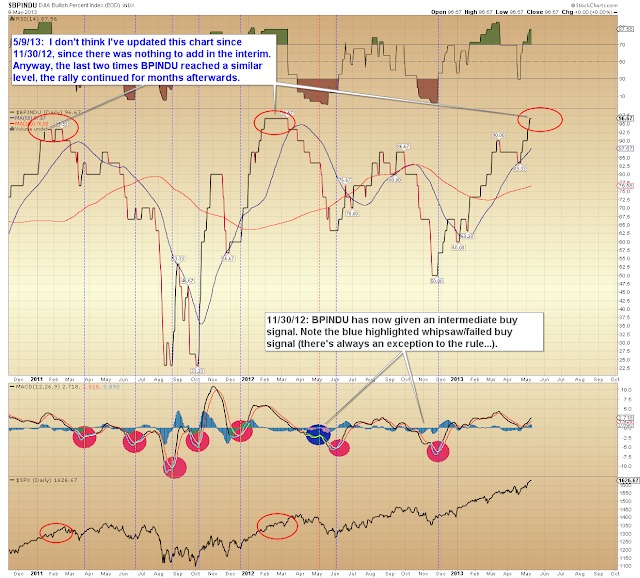 First up, there is some recent noteworthy behavior in the Dow Jones Bullish Percent Index (BPINDU). I can't recall updating this chart since November 2012 (See: SPX Update: Intermediate Buy Signal Triggered), because there's really been nothing to say about it since -- at least, until now. 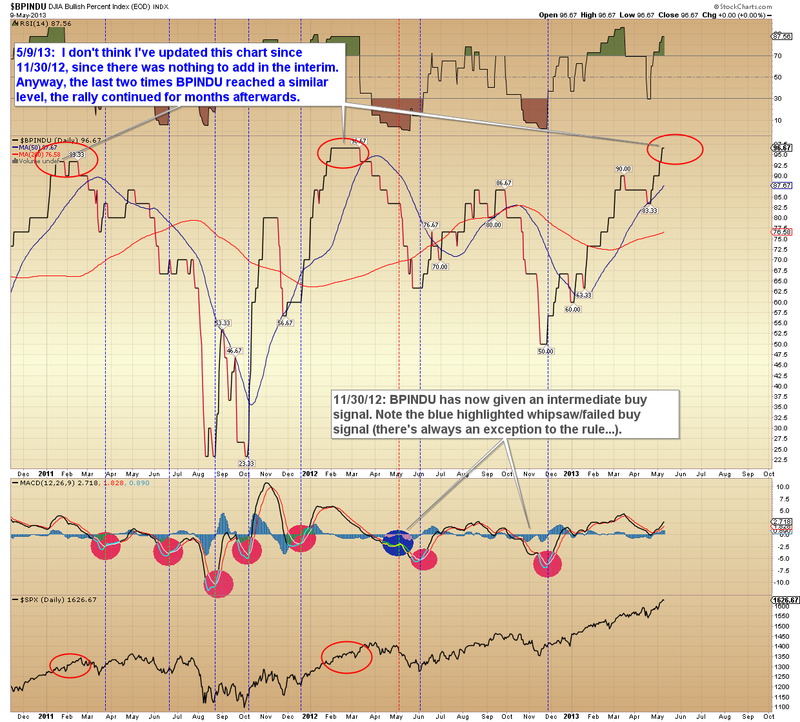 While the current reading is characterized as "overbought," this type of overbought reading also typically suggests a strong trending move in price which will ultimately continue higher. Next of note is the Philadelphia Bank Index (BKX), which briefly exceeded the 2010 print high. Earlier in the month I opined that if BKX cleared 57.6 then it was likely headed to the high 58's in fairly short order. 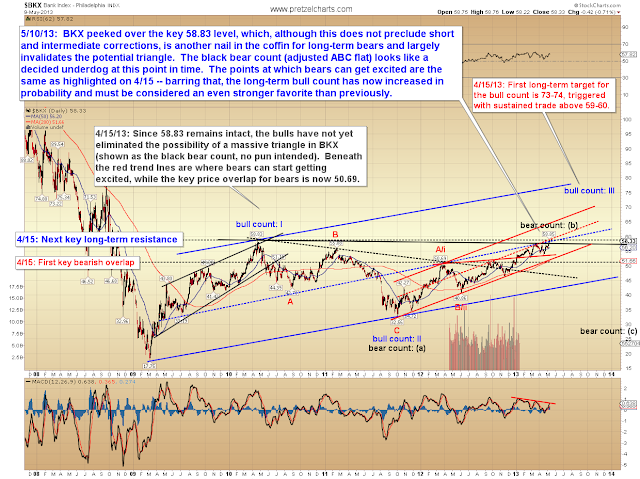 This event now breaks some of the potential bear waves, which further limits the bears' long-term options. It also made for a quick easy-money trade if you played the breakout. I also want to discuss a bit of terminology, because it's very relevant to these outlooks. Probably the most important is a discussion of the term "correction." While the mass media tends to use "correction" as a way to describe "pretty much any decline," I do not use that term generically, as it has a specific technical meaning in Elliott Wave. 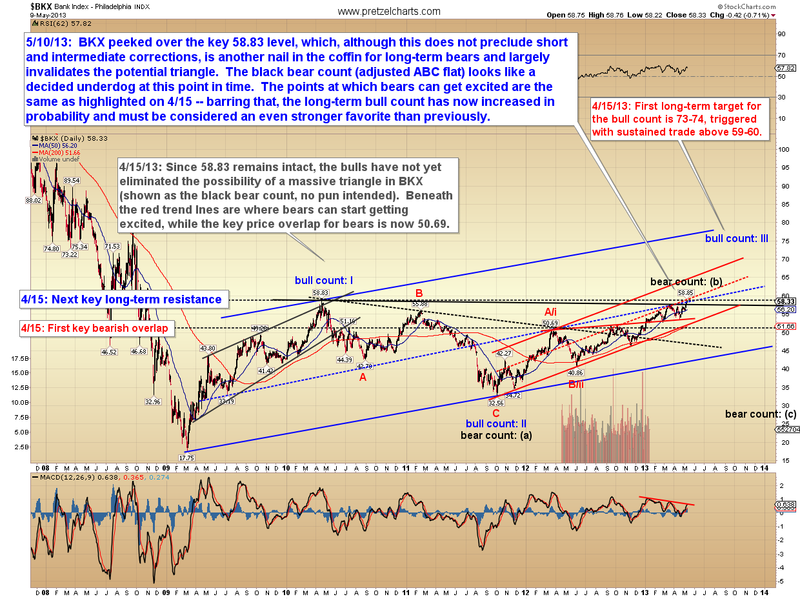 "Corrections" are waves which run counter to the prevailing trend of the wave at next highest degree. 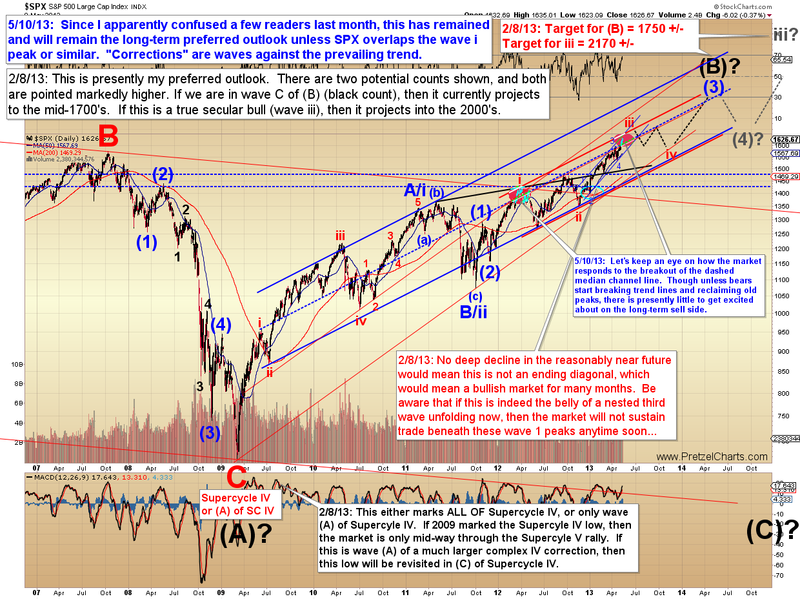 In other words, bull markets experience downward corrections, while bear markets experience upward corrections. Corrections are thus, without exception, always expected to be fully retraced; so please keep in mind that when I say "the market looks likely to experience a correction," I am always referring to a counter-trend move. 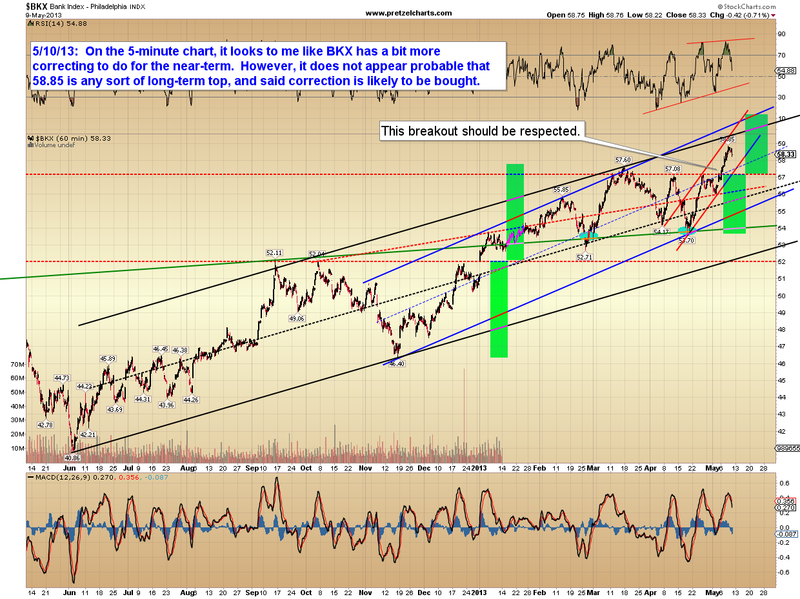 Also, be aware that counter-trend trading is generally not a good idea for the inexperienced. The practical difference between trading with the trend versus against the trend is that if you're trading with the trend, the market will eventually bail you out of a bad trade entry. If you are truly with the trend, prices will eventually come back to your entry at some point. However, if you are trading against the trend, the market can leave you high and dry and not look back for weeks, months, or years. A bad counter-trend trade entry will almost always cost you money. If you're trading counter-trend and you're late to the party, then fuggedaboutit -- skip the trade. Please choose safe entries and use the provided analysis accordingly. Also, briefly, since we're discussing my personal nomenclature: "short-term" means hours to days; "intermediate-term" means weeks to months; "long-term" means months to years. There are really only so many relative terms out there, which can sometimes make finding proper descriptors difficult, especially since the market itself seems to necessitate some degree of vagueness in time-frames. Anyway, while the end portion of last month's attempt at catching an intermediate correction fell flat, the long-term S&P 500 (SPX) preferred outlook still remains bullish, as it has all year (updated chart below). I'm wondering if now that the rally's true strength has become more apparent, bears might find additional solace and/or enlightenment in my January article A Survival Guide for Bears in a Bull's World, which was based on my own personal journey (in 2012) to reconcile my fundamental bearishness with my technical bullishness. I now suspect the article was a bit too far ahead of the mass sentiment curve at that time, but might be better-received now. 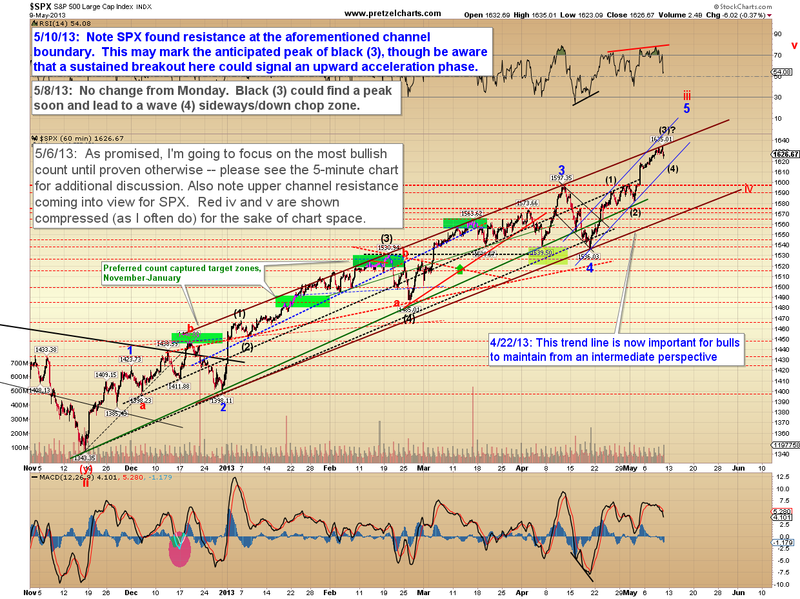 The SPX hourly chart notes the near-term reversal from the upper boundary of the trend channel. 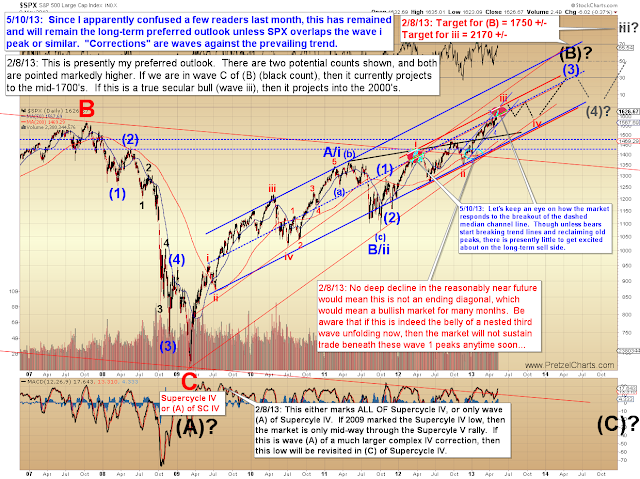 In conclusion, markets don't go straight up forever, so a fourth wave correction in the near future would not be out of the question -- however, the indicators continue to suggest that there is no long-term top on the foreseeable horizon. (And I see now that we've ended up with more words than I originally thought I'd have time to write... which is good, because that means the "but I read this for the articles!" excuse remains fully intact.) Trade safe, and have a great weekend! Reprinted by permission, copyright 2013 Minyanville Media, Inc.
"Two Recent Indications that Long-Term Strength for Equities Should Continue". keep up with you. Would you list of all of your public sites like your Facebook page, twitter feed, or linkedin profile? Hi, Neat post. There's a problem with your site in web explorer, might test this? IE nonetheless is the marketplace chief and a big part of other people will leave out your magnificent writing because of this problem. great stuff as always. I am no EW expert, so pls forgive if questions are very basic. You are saying that we are in 3 of 3 of 3 basically which is longest and most relentless, right? but is there any count structure within EW to determine (once 3 of 3 of 3) have been identified, what are the time targets for minor 4 of 3 and then minor 5 of 3, and then major 4, and how much should major 4 retrace? With any plan choices will need in order to become weighed. Instead you would opt for naturopathy that has no side effects almost all.